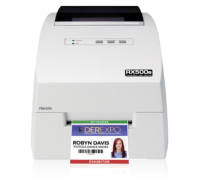 RX500e is the only desktop full-colour RFID label and tag printer that’s fully integrated. It utilizes the latest in ultra high-resolution colour inkjet technology to produce labels and tags at speeds of up to 2.5” (63.5 mm) per second and up to 108 mm (4.25”) wide. Built-in, automatic RFID encoding makes it ideal for applications that need both colour and RFID, including file folders, asset tracking, retail & apparel tags, data storage tapes, lab specimens, wristbands, identification and visitor badges, pharmaceuticals and much more. 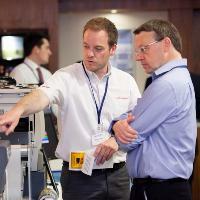 An automatic guillotine can be set to cut of each label, badge or ticket printed or at the end of a printed strip. Video shows the LX500e label printer but the RX500e is similar but programming the chip in each label, tag or ticket as it goes.